The Washington Nationals announced this morning that rookie pitcher Stephen Strasburg will be out for the rest of the season and will likely have Tommy John Surgery. The news came to Strasburg Thursday after the result of his arthogram showed a “significant” tear of the Ulner Collateral Ligament in his pitching elbow. Strasburg and the Nationals refrained from announcing the arthogram results until this morning out of respect for Bryce Harper’s introductory press conference at Nationals Park that afternoon. Strasburg will get a second opinion from Dr. Lewis Yocum in California in the coming days, but he remains optimistic, determined, and ready to take on this new thing in his life, Rizzo said. The Nationals believe that Strasburg’s rehabilitation after surgery, if it takes place, should be a typical Tommy John rehabilitation and will take anywhere between 12-18 months. Update, 11:30 a.m.: Tommy John surgery is a procedure where a ligament from the medial elbow is replaced with a tendon from elsewhere in the body. Possible options are tendons from the forearm, hamstring, knee, or foot. Tommy John surgery is common among collegiate and professional athletes in several sports, mostly baseball, and several pitchers who have undergone the procedure have made a healthy recovery. These pitchers include: Chris Carpenter, Tim Hudson, Josh Johnson, Billy Wagner, Erik Bedard, and Joakim Soria. You should note that Strasburg’s recovery probability is likely close to 95%, he should be fully ready to pitch opening day 2012, and his performance at that time, with the intense rehab, conditioning and focus on mechanics, should be as good as ever. 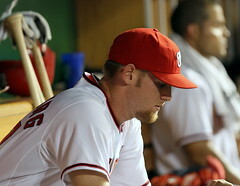 Also, as a side benefit to the Nationals, since Strasburg will go on the 60 day DL, he will be exempt from the active 40 man roster the rest of this year and all of 2011 and his service clock will be stopped until 2012. This will result in Stephen staying with the Nationals longer than perhaps anticipated, and the Nationals getting the benefit of more ‘prime’ pitching years. What a waste!! I drafted this kid to see him sent down to the minors for half the season. Now after a few games he’s hurt….I should have known better than to draft a rookie no matter how good he is supposed to be. He just needs to spend some of those millions he got, that will cheer him up.